Pigeons can be a serious nuisance when they congregate in numbers in one place and their droppings are not only unsightly, but can also rapidly become a health hazard. Periodic culls organised by your local council may help to reduce overall pigeon numbers, but installing Bird Spikes (pigeon deterrent spikes or seagull spikes) on and around your premises will provide you with a more immediate solution to your specific problems! ...and at the special low prices offered by Insight Security, everyone can afford to use these anti roosting spikes to solve their bird / pigeon problems. Insight`s range of bird deterrent spikes include feral Pigeon Spikes and Seagull Spikes as well as the usual accessories such as gutter clips, window clips and adhesives, which are suitable for use with either type of spike. You can stop the mess and health hazard posed when birds congregate in a location, simply and cost effectively with this range of practical bird deterrent spikes. Manufactured from weatherproof, UV stabilised polycarbonate (or polycarbonate and stainless steel), the spikes can be fixed in place with screws, cable ties, or special adhesive. 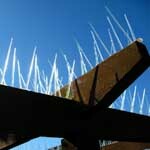 Defender Pigeon Spikes are manufactured from robust, UV stabilised, weatherproof polycarbonate material. To combat the razor sharp beaks of the more aggressive seagull, the spikes on the Seagull Spike product are manufactured from stainless steel. For wider window sills, ledges, parapets, etc. bird ban spike strips can be installed side by side. (Note: although pigeon spikes are cheaper than gull spikes, where a ledge is wider than can be covered by a single row of pigeon spikes, if one row of gull spikes will cover it, it will work out cheaper. When strips are installed side by side, the maximum recommended gap between the rows measured at the top of the spikes is 50mm for pigeon spikes and 100mm for gull spikes. The 335 mm strips are typically installed end to end and being manufactured from polycarbonate can be easily cut with a hacksaw where a shorter length is required (i.e. for installation onto a small CCTV camera housing). Screw Fixing: the base of each strip features multiple fixing holes to allow them to be screw fixed in position where appropriate. Adhesive Fixing: as an alternative to screw fixing, external SILIRUB 2/S (with built in fungacide) instant silicon adhesive, can be used to bond the pigeon spike strips to window sills, ledges, wall toppings, etc. One tube of Silirub will be sufficient to fix 24 pigeon or gull strips in position). Window Clips: our special window clips provide a simple way to fix pigeon spike strips to opening windows, where fixing the strips to the window sill would foul the operation of the window. Cable Ties: offer a simple solution to attaching anti roosting strips to pipe-work, CCTV cameras or light housings, etc. Defender pigeon deterrent spikes are manufactured from clear, UV stabilised polycarbonate material, are quick and simple to install (bond-on, screw-on or clip-on fixing options), easily affordable, and provide a practical yet harmless way to prevent pigeons from congregating or nesting on ledges, window sills, in roof gutters, on CCTV camera or lighting housings, etc. Rain guttering around roofs are a favoured pigeon resting place as they offer protection against the wind, etc. Pigeons can however cause a build up of waste materials in guttering which can lead to blockages, leaks, etc. and cause damage to your building. The special gutter clips simply clip on to the base of the pigeon spikes and then clip over the edge of the guttering. They also allow simple removal of the spikes (no tools required) for gutter clearing, etc. Window clips provide a simple way to attach pigeon spikes and seagull spikes to opening windows. Obviously, if pigeon spikes were attached directly to the `window sill` in this situation, it would prevent the window from being opened. Cable-ties offer a simple solution to attaching pigeon spikes to vulnerable drainage pipes, CCTV camera housings, etc. These special nylon pull-tite cable ties are available in a choice of black or natural. Our exciting new ready to install Bird Free Fire Gel product (sometimes referred to as Bird Free Optical Gel) has been proven effective worldwide ... and following extensive UK site evaluation tests has now been adopted by many Local Authorities and major commercial companies as the solution of choice to tackle problem pigeons or seagulls. Safe - no dangerous chemicals to worry about - as the active ingredients of this product are food grade materials, the UK Health and Safety executive have granted Bird Free Fire Gel a derogation under the Biocidal Products Directive (EC Regulation No. 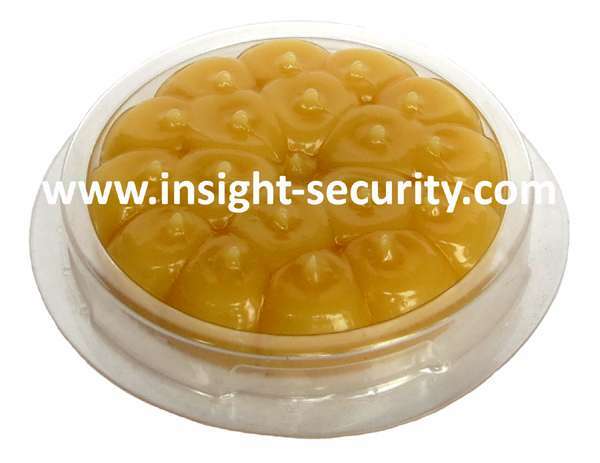 1451/2007), which means that Bird Free Fire Gel can be handled and installed by a professional pest controller or any competent handyman following the manufacturers installation guidelines.